Music Classroom Library meets Book Buddy Pro! music teacher. To find out more about how I organized my library, check out my blog post HERE! As organized as my library is, the organization is only effective if I can actually remember how I sorted my books in the first place! Nothing is more frustrating that looking for a book and not being able to find it quickly. I’ve made spreadsheets in the past with titles and author lists, but it was a very tedious process and not entirely effective…. THEN I found Book Buddy Pro! and my classroom library has been revolutionized! When you open the app, you get this screen. Just click the + in the top left corner to add a book. You can use your iPhone camera to grab the bar code either one at a time or you can scan multiple books at once. If I could build my Book Buddy collection over again, I would have taken the time to choose “Professional” category. I didn’t choose a category and I haven’t figured out how to change it. Here is the other really cool thing! IF when the bar code is scanned, any information is missing, (i.e. title or author…) Book Buddy highlights the required area and prompts you to add the information before allowing you to save. The only fields that are required are the title and the author. About 80% of my books scanned immediately with no problem. Older books and paper backs that have the bar code covered by price tags didn’t scan, but were very simple to add manually. Once you have more than one book entered either by bar code, internet or manual entry you can choose the “down arrow” icon on the bottom and choose how you would like to sort your books. 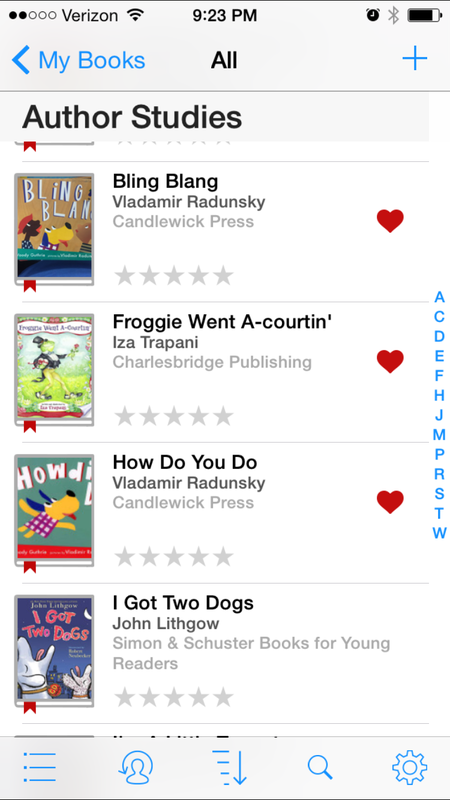 You can use the FREE version of Book Buddy for the first 50 books. My VERY VERY VERY favorite part of this app is the “More Fields” section! This section is what sets Book Buddy apart in terms of classroom library management. You can add whatever fields you want! I’ve included several pictures because there are so many fields to choose from that I had to scroll down to grab a picture of all of them! For me, the most useful field that has changed my library life is the “physical location field”. I can match my very organized books with the bin that I keep them in. There is even a place for notes. It’s in the notes section that I keep track of the books that I pull for my sub tub. Now, if I need a book, I can look it up quickly on my phone to see where it will be. It gets even better! I can export my entire database either as an HTML file complete with pictures and listed info OR a CSV or TSV file. The CSV file opened up easily in EXCEL and I was able to edit out the fields that I didn’t use and get a fully populated printable library! It is very easy to backup everything using Dropbox. The best part is that now I can share my library without a lot of fuss. In about 3 hours I had 263 titles completely organized and accounted for! To check out the HTML version click HERE! To download my entire library list as a PDF click HERE!